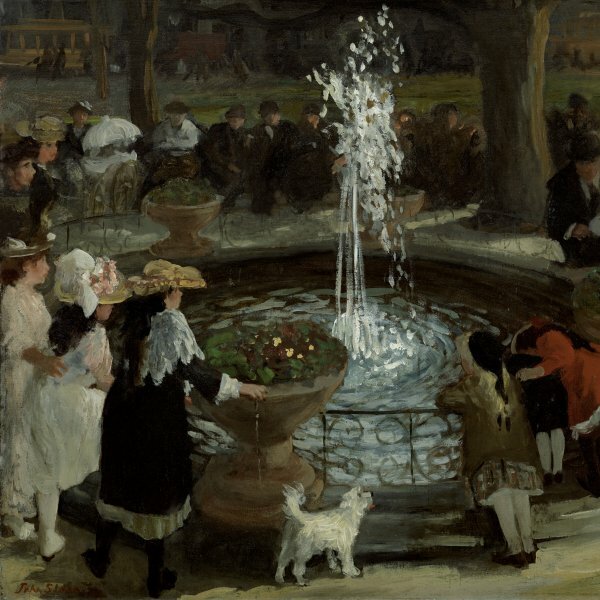 A follower of Robert Henri and member of the group of The Eight, John Sloan spent most of his childhood in Philadelphia, where he and his family went to live in 1876. In 1888 he got a job with a publishing company and started practicing etching as a self-taught artist. From 1890 onwards he held various jobs as an illustrator, initially of calendars, cards and books, and later for the Philadelphia Inquirer and Philadelphia Press. Between 1895 and 1897 Sloan travelled around Europe and in 1904 he settled in New York, following Robert Henri, who had began to teach at the New York School of Art. In 1908 he and another seven artists took part in an exhibition entitled The Eight at the Macbeth Gallery, to show their opposition to the conservatism of the National Academy of Design. After taking part in the Armory Show in 1913, Sloan began to concentrate on the formal aspects of his work and to apply the colour theories of Hardesty Maratta. He secured a teaching post at the Art Students League in 1916 and from then onwards spent his summers travelling to Gloucester, Santa Fe and New Mexico. In 1939 he published The Gist of Art, which summed up his teachings in the field of art. He died in 1951.